Even after posting an 8-2 regular season record, a revitalized Lufkin Panthers’ defense knew their real test would come when the playoffs got underway. With the Rockwall Heath Hawks in town for a Class 6A Region II Bi-District showdown, that defense passed its first postseason test with flying colors on the way to an impressive 28-7 win at John Outlaw Memorial Field at Abe Martin Stadium. The Lufkin defense held Rockwall Heath to 188 total yards, including just 40 before the break. The key came against standout running back Tanner McAlister, an Arkansas commit, who was held to 35 yards on 16 carries. The Hawks were held to a total of 67 yards on 34 carries. Lufkin got plenty of big-time performances from an offense that was stymied by its own mistakes for the majority of the first half before finding its way after the break. Isaiah Phillips finished the night with 163 yards and two touchdowns on 28 carries while Kewone Thomas ran for 56 yards and a pair of scores on 11 rushes. That proved to be the difference as Lufkin dominated the second half on the way to the 21-point win. Thomas threw for 184 yards on 11-of-17 passing, while Ja’Lynn Polk had three catches for 91 yards. Malik Jackson had four catches for 55 yards. The first half started with a flurry of big plays before the defenses took over in the second quarter. Lufkin’s first drive appeared ready to stall when a fumble and chop block pushed it back into a third and 33. However, Lufkin made the most of it with Ja’Lynn Polk breaking free for a 40-yard completion from Kewone Thomas. However, that drive stalled a few plays later when a Thomas pass slipped out of the back of his hnad and was recovered by Heath’s Cutter Cleveland at the Lufkin 49. The Panthers’ defense stepped up in forcing a three and out before Heath’s Bijan Nichols pinned the Panthers at their own 3-yard line. The Panthers’ offense answered the call on the following drive with Polk catching a 33-yard pass on third down to keep the drive alive. That helped set up a 46-yard touchdown run by Phillips that gave Lufkin a 7-0 lead with 2:34 left in the first quarter. The defenses exchanged stops in the second half with Lufkin moving the ball but failing to convert its chances. Heath was held to a total of 40 yards on 19 plays in the first hlaf with Tanner McAlister running for 16 yards on five carries. Garrett Cody completed 5-of-9 passes for 22 yards. 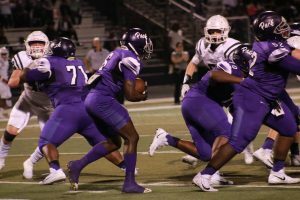 Lufkin’s offense was able to move the ball in garnering 222 yards of offense but was set back by seven penalties for 70 yards before the break. Phillips ran for 99 yards and a touchdown on 12 carries while Polk caught three passes for 91 yards. Thomas completed 8-of-13 passes for 146 yards. Lufkin finally got some breathing room early in the second half when Savon Fields jumped on a bad snap by the Hawks at the Heath 36 yard line. The Panthers went to the ground to seize the momentum on a drive that covered 36 yards on eight Phillips’ carries. Phillips eventually scored on a one-yard touchdown on fourth down that made it 14-0 with 7:35 left in the third quarter. Heath finally got its offense going on the next drive, which covered six minutes and 12 plays. However, it came to a screeching halt when Tanner McAlister was stopped for a four-yard gain on fourth and five at the Lufkin 24. The Panthers’ offense kept the ball rolling in its favor with Thomas breaking free for a 47-yard run that set up his own one-yard scoring run, making the score 21-0 with 11:02 left in the game. Heath finally got on the board with 6:05 remaining as Tanner Cody hit Jackson Salley for a short pass that he turned into a 33-yard touchdown reception, narrowing the gap to 21-7. After recovering the onside kick, the Panthers erased all doubt with a 17-yard touchdown run from Thomas that made the score 28-7 with 2:29 left. The Panthers (9-2) now advance to the area round of the playoffs where they will take on Richardson Pearce on Nov. 25 at 2 p.m. at Corsicana High School. Heath ended its season with a 6-5 record.